Ackermann Fine Art Knightsbridge, London. Exhibiting selected pieces all year. Crake Gallery Johannesburg, South Africa. Exhibiting selected pieces all year. Everard Read Gallery Johannesburg and Cape Town, South Africa. Exhibiting selected pieces all year. Pashley Manor East Sussex. 1st Apr-30th Sept.Exhibiting selected pieces. Rountree Fine Art London. Exhibiting selected pieces all yearin various mixed shows. Russell Gallery London. Exhibiting selected pieces all year in gallery and at Art fairs. Olympia Art Fair London. 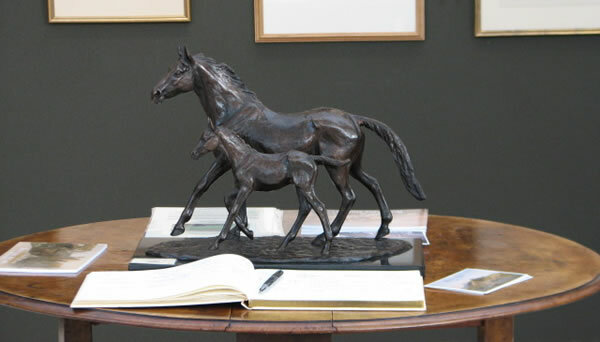 Mare and Foal, Rountree Fine Art stand, Olympia 2010.